Today’s 1:5:10:365 Tip has more information about sealing out unwanted infiltration. 1:5:10:046 Tip: Attached garages can contribute significant air pollutants to the home. 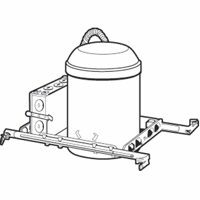 Our garages are used to store vehicles, lawn mowers, and various types of chemicals that can outgas harmful pollutants. These gases can be carried into the home through inadequate door gaskets and air infiltration through electric outlets and sill plate seals. Attached garages are a very important place to use the sealing techniques we’ve covered over the last few days. Today’s 1:5:10:365 Tip is about another way to test for infiltration coming from unintended places. 1:5:10:046 Tip: A blower door is a calibrated fan that can be used to determine the amount of air leakage in a building. It can be used in combination with thermal imaging or a wizard stick to “see” the places where energy is being lost and air quality compromised. 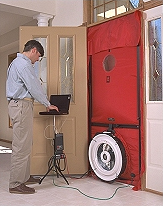 The blower door tests the amount of leakage by blowing a measured amount of air into the home. The pressurization of the home is then measured to determine the amount of air that is flowing out. If air entry points such as doors and windows are closed, then the air that is escaping is exiting through other openings such as can lighting (:044), electrical outlets (:041), and other openings. Tomorrow I will talk about air infiltration from garages. Check with your local public utility. Many offer low-cost or no-cost energy audits including blower door testing, or they may be able to provide a referral. Today’s 1:5:10:365 Tip is about air tight can lights designed to be in contact with the insulation. 1:5:10:044 Tip: Ceiling can type lights have historically wasted a lot of energy. Many states are now requiring Insulation Contact and Air Tight (ICAT) can lights for new construction, but this means there are a lot of old leaky ones. Don’t merely try sealing a leaky can light or covering it with insulation. The heat build-up can create a fire. 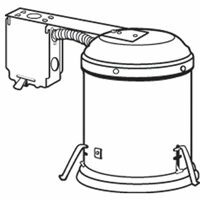 Instead, the light fixture should be retrofitted with an approved kit, or replaced with a ITIC unit. The above thermal image shows a can type light with a dark ring around it. The dark ring represents air infiltration. The lighter blue areas represents insulation missing between the ceiling joists. Placing a puff of smoke from the Wizard Stick (:039) near the can light further demonstrates the air infiltration. Today’s 1:5:10:365 Tip for becoming a better steward for our home and planet deals with sealing outlets to prevent air infiltration and save energy. 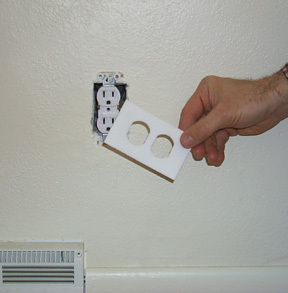 1:5:10:041 Tip: Inexpensive gaskets are available that can be used to seal wall outlets to help prevent air infiltration. You can purchase these at any hardware store. Make sure to check with the Wizard Stick after installation to be sure the gasket has properly sealed the outlet cover.